At the beginning of issue #6 I thought that we were seeing a flashback of Willa and her father. I don’t know if that was intentional or ironic. The story shows people boarding a train that creates artificial gravity. The girl I thought to be Willa described “gravity” perfectly. It one of those subtle things I notice about the book that makes it so clever. Obviously Willa and Edison are on the train too. Willa’s father has put her on a quest to cure the world and escape Barrow. The answer is in Kansas City too. Their train ride isn’t long one and they stopped in a forest. Joe Henderson comes up with some ideas about what happens when there’s no gravity. BUGS…What happens to bugs, specifically dragonflies? You’ll see. Lee Garbett’s art is still fantastic. He seemed to put a more gritty look to the characters and the surroundings. This issue is a nice set up for what’s about to come. I can’t wait to see what our creators have in store for us next…since the ending was a cool cliffhanger. 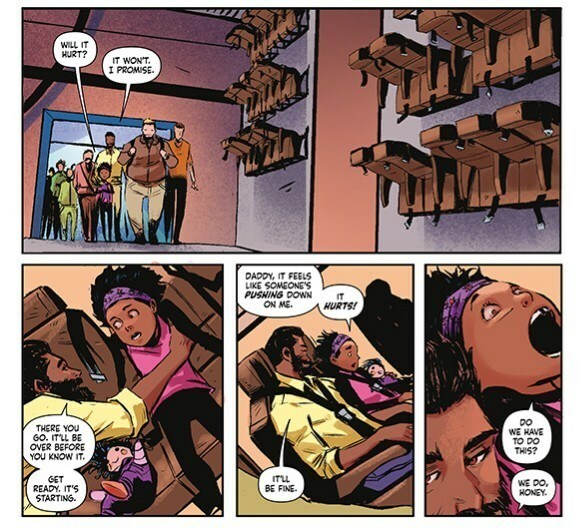 “The original pitch for SKYWARD is the story of a father and a daughter on a road trip through a low gravity world. The father is afraid of everything and the daughter is fearless. Over the course of the journey, they learn from each other, and meet in the middle.” This was at the end of the book and I liked how Willa’s father had to let her go to save her. It allowed to let character in Willa become a hero.